I’ve seen function and stylish tea infusers, but this is one that is both – and clever, t boot! 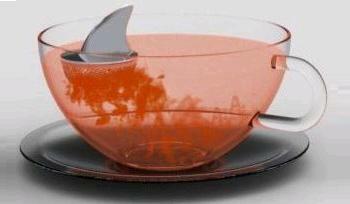 The Sharky Tea Infuser is a creation of Argentinian designer Pablo Matteoda. The lightweight infuser has an air pocket in the top of the fin to keep it upright and afloat in your tea, while the perforated base (removable, for easy filling) lets your tea infuse into your cup. Rooibos – or another herbal red tea – is a good choice for this infuser simply because it fits the look well. Unfortunately, this lovely piece of design is still just a concept for now. It will be great for Jaws fans when it is released, though!